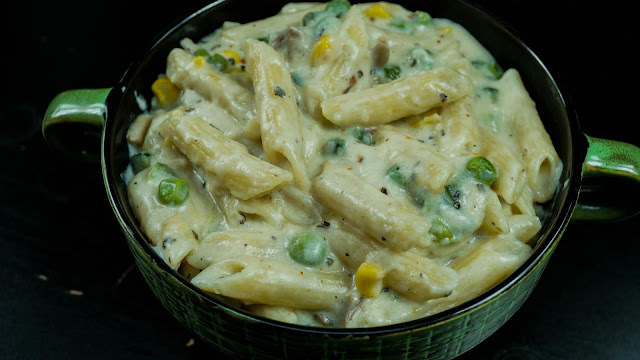 Pasta is a famous Italian recipe made with creamy white sauce base, This is a simple yet delicious recipe which is enjoyed by kids and adults. This is an excellent lunch box recipe. I have added veggies to make this pasta recipe more special. Lets see how to make this creamy white sauce pasta. Step 1) Bring water to a rolling boil and add required salt, then add pasta and cook until its soft and tender, I cooked for approximately 15 minutes, follow the instructions/time on the packet for best results. Once its done drain the water , coat with a tsp of oil to prevent drying and keep it aside. Step 2) Heat Butter and add finely chopped garlic, then add mushroom and saute until soft. Then add peas, corn, capsicum , little bit of salt and cook for 2 -3 minutes. Once the veggies are done transfer it to a plate and keep it aside. Step 3) Now in the same pan melt butter and add flour / maida. Cook on a low heat for a minute until the raw smell is gone. Then add milk and cook until the milk thickens slightly. Step 4) Once the milk is thickened add grated cheese (cheese is optional). Now add the saute'd veggies , pasta, basill, chili flakes and required salt. Mix it well and let it boil. Finally grate some Parmesan cheese on the top before serving (optional). That's it our delicious and easy creamy white sauce pasta recipe is ready to be enjoyed. Please do try this recipe at home and share it with your friends and family. Happy Cooking !!! !